Get an original cartoon, which will be drawn from photo, in colored pencils style. Cartoon Drawing will be created within a couple of days. Such a classic and funny image can be drawn featuring your daily outfit or we can add a favorite theme for you for free. Just mention your idea in the requirements box below and our Photolamus artist will draw your cartoon carefully and brilliantly. 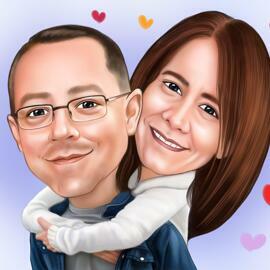 Such a friendly-made cartoon drawing will also make a unique gift for someone special like your boss, colleague, parent, friend or employee, just upload him or her photo below. Additional delivery options: Cartoon drawn in Pencils on Paper A4, Cartoon printed on Canvas, Photo paper. Worldwide delivery. Caricatura coloreada de mujer en estilo digital.